Washington’s Virginia mansion reflects the complexity of its owner. Mount Vernon was designed by George Washington to show its magnificence whether it was approached from the front or the rear. ALEXANDRIA,Va. - The splendid mansion and great view overlooking the Potomac River are the same as when we visited there 45 years ago, but added features have really changed the experience of visiting Mount Vernon, the plantation President George Washington improved over the 45 years that it was his home. The most outstanding addition, a delight and well worth the second trip, was the $24 million Donald W. Reynolds Museum and Educational Center, which makes Mount Vernon a rival to the most up-to-date presidential libraries and museums, such as the Clinton and Reagan museums. Much attention has been paid to reproducing how Washington looked at different ages. 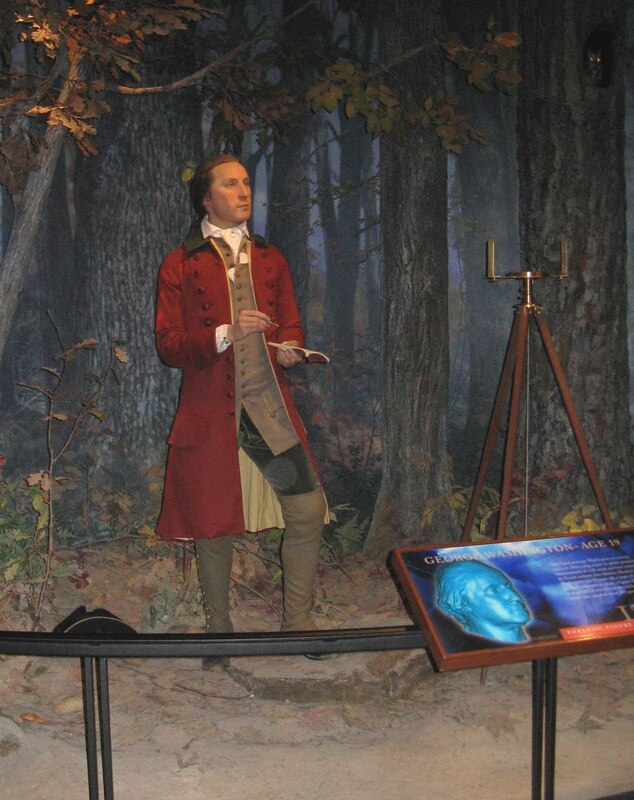 At three scenes in the museum, we saw life-size models of Washington as he looked during three periods of his life: as a surveyor at 19, as a general of 45 astride his horse at Valley Forge and as president at 57 taking the oath of office. The only portraits of Washington in existence show him after the age of 40. From a film we learned how artists and experts in computers and forensics could use a picture or sculpture of an older person and create reproductions that showed what that person probably looked like when young, mature and middle-aged. They also examined his clothes from different periods to get his underlying shape right at various ages. The many films are exceptionally good, nine being from The History Channel. One film shows his granddaughter in her old age telling us about the sculpture that was made of Washington and how frightened she was at first, thinking he had died, when she saw him lying still for the fitting of a mask. Glenn Close narrates a film about Martha and his closeness despite the years her husband had to be away. She had burned all their letters to ensure privacy. During one film on famous battles in which he was involved, audience members reacted to the explosion of bombs, flashing lights and lots of sound. 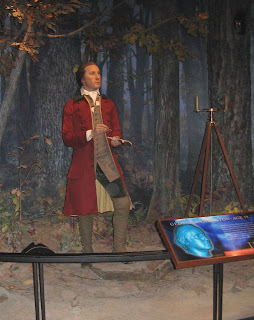 In various interactive displays, we could follow Washington’s life from childhood through the trials after his father’s death left no money for the formal education that his older brothers had received, Washington’s self-education, the learning of manners and becoming a gentleman, his historic moments and, finally, his becoming the most beloved and richest man in America. Washington’s coach has been carefully restoredThe orientation at the visitor’s center gave us a large-screen presentation on the heroic Washington: his brave acts in the French and Indian War and his capture of almost 1,000 Hessians after crossing the Delaware River in 1776 during the Revolutionary War. Lines were long at the entrance to the mansion at Mount Vernon. In groups of 20 we entered the different rooms and were met by a guide, who gave us a story of that room plus other information about Washington as an architect and as a host. It seems that homeowners were expected to provide rooms and food for travelers because hotels did not exist at the time. As the most popular man in America, he sometimes had more than 600 overnight visitors a year. All of this attention at times wearied him, and he had separate quarters added to the building with a separate entrance to his and Martha’s bedroom, and his office. The outbuildings were restored and equipped as they would have been in his last years on the plantation: a head gardener’s house, a salt room for curing fish and meat, a weaving room and 10 or so other buildings. He was a master farmer who studied and experimented to see that he got the most from his soil and his workers. We took a separate tour of the landscape and gardens. Washington completely redid the gardens, and this included both flower gardens and vegetable gardens. The gardens are still producing, and the produce is given to food banks or to the more than 500 employees on the Mount Vernon staff. Our guide also showed us how manure and human waste were gathered in the past and used to enrich the soil. We did not have time to take the slave tour or the treasures tour. At lunch on the grounds, we dined on the colonial-style fare George and Martha would have served their guests, including duck pie. The atmosphere was fun with waiters in 18th-century costumes, period furniture and working fireplaces. We also visited his and Martha’s tomb. As Congressman Henry Lee, father of Gen. Robert E. Lee, eulogized him, Washington was, "First in war, first in peace, and first in the hearts of his countrymen." What an interesting tour. Nothing better really than going out ourselves and experiencing history. Would love to do this sometime.